I had never heard of CTC Mall before this. My sis in law was visiting for her wedding shopping, and this name was on the highly recommended list. For those of you like me, CTC Mall in Delhi happens to be a one stop shop for all your bridal needs. From bridal lehengas, groomswear outfits to prewedding outfits like gowns, fusion Indian wear, sarees, suit sets, footwear, wedding bangles, accessories, purse, handbags, towels, bed sheets, covers and much much more. You get everything in this one store. But primarily CTC Mall, Delhi is a bridal lehenga destination. The store is a 3 floor building. Basement has the bridal collection, the ground floor has accessories like jewellery stand, artificial jewellery, purses etc and the first floor has suit set piece, anarkalis, sarees, and footwear. 1. Their display of outfits. Every outfit is neatly displayed for brides to get easy access to lehengas. You can pretty much pick it up from the hanger and put it up on you and look at yourself in the countless floor length mirrors all around the store. If you are shopping for lehengas or gowns, you will see that none of the outfits are folded and kept. A huge huge advantage for any bride and her entourage. 2. Outfits are showcased separately with respect to colors, fabrics and work. So a lot of pastels together, vs. sequins on one side and so on. I saw a lot of pinks, in blush pink, fuschia and dark pinks together which really made it easy to pick and see which color flatters the most. Their display also ensured that you need minimum help from the sales staff to navigate through the display. I swear, if you visit this store and compare it to Chandni Chowk…you will notice a huge huge difference. Your budget might be the same, but the in store experience is no where comparable. So take for instance, you go to Om Prakash Jawaharlal for your dream wedding lehenga, you know you might get that Sabyasachi lehenga from that store…but you come home with the worst in store experience..not to mention no clue whether you over payed for your lehenga. CTC Mall pretty much gives you gorgeous options in the same price range. So why not get better service for the price you’re paying? 4. You won’t get duped with the quality. This I’m speaking out of my experience. My sis in law picked up her wedding lehenga rom CTC Mall, and they delivered in within 7 working days and it was exactly what she wanted. Done to perfection. That glow on her face when she put it on without any complains of stitching, alteration nothing needed. It was priceless. I have read in so many articles, comments of brides not getting the same color, same fabric, same work lehenga when they shop from Chandni Chowk stores. It is a huge setback and while I’m in no way saying don’t go shop there, I just want you to have a look at this store as well. How many times has it happened with you that you enter a store, and just wait and wait while the salesperson keeps showing you lehengas in which you have no interest. He keeps trying to figure out your style while you get agitated and waste that precious lehenga shopping time. It has happened to me on countless occasions, and I’m sure you must have faced similar issues as well. In my sister in laws case, we ended up deciding on her wedding lehenga in straight 45 mins or so. It was unbelievable. It was the first store we went in for her wedding lehenga shopping, and she pretty much decided then and there the one she wanted. No second thoughts. Think Sabyasachi, Manish Malhotra bridal lehengas. Not possible to buy for everyone right? But if you’re hell bent on having one at a fraction of a cost, well not fraction but definitely much lower, then CTC Mall is the place to be at. From floral zardosi work in velvet to Sabyasachi like head to toe gold sequins outfit. They have it all. Its definitely not cheap. A good bridal lehenga like the ones you see in the pictures are anywhere from 70k upwards to 1-1.5 lakhs and some even higher up. But you will get a decent piece with a nice flare, full heavy work lehenga within 70-90k. In case you love a particular lehenga but the budget is higher than what you can pay for, then ask them for customization of your wedding lehenga. All their lehengas are made in house, so they are quite flexible with customizations. You can try asking if you reduce some work, what difference would it make to the price etc etc and go from there. PreWedding outfits were as expensive as the bridal outfits. So in case you want a pastel shade sequins lehenga, or a floral print lehenga, they all were 50k+. Even the sober ones with less work and more focus on the color shade were quite on the higher side. Ditto with western gowns. I so wish they had few affordable options out there. 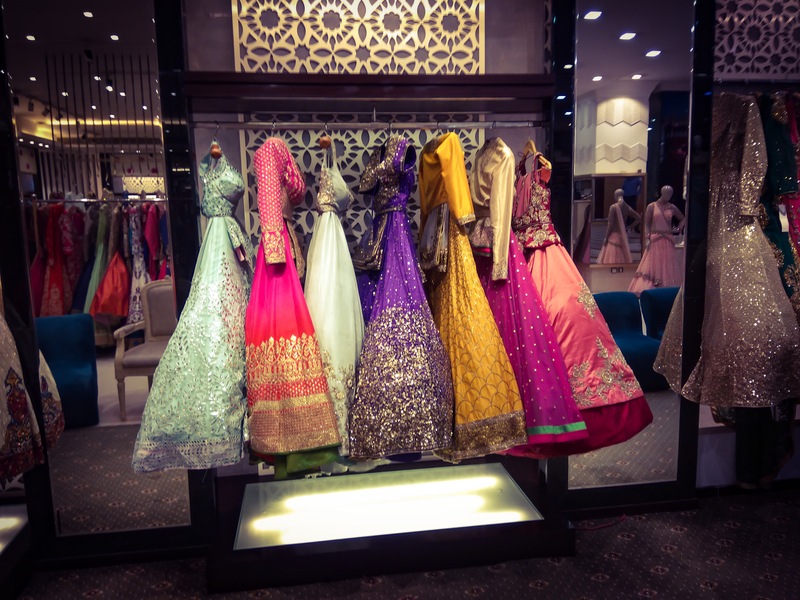 Overall, what I feel is that for any bride who has multiple functions in her wedding, and has a range of outfits to buy…can’t decide between lehengas, gowns, etc then you must come to this store once before heading anywhere else. Not only can you see a world of options in one place, you can even try out and see for yourself what will work best for you in terms to fabric, colors, prints and designs. It really is a win win for you to get everything under one roof. Najafgarh Road, Moti Nagar, New Delhi, Delhi 110015. All the photos from the #YuvrajHazel Wedding in one place !